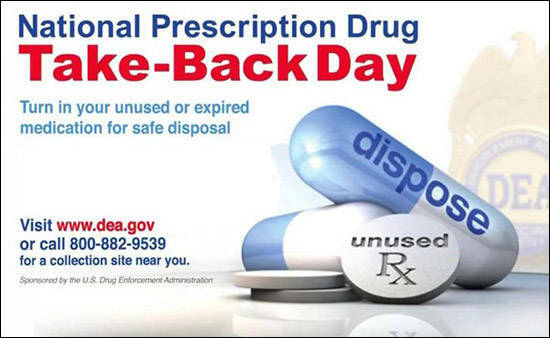 GALION — National Prescription Drug Take Back Day is Oct. 28, from 11 a.m.-2 p.m. The Galion Police Department is encouraging residents to turn in unused or expired medication for safe disposal. Operation Medicine Cabinet and other collection programs protect our children, our water and our food supplies, and decrease prescription drug abuse by making it easier for you to properly dispose of unused or expired medication. This is a completely confidential program. No personal information will be collected. Please remove all prescription labels before arriving. The Galion drop off location is the Community Room at Galion Public Library, 123 N. Market St. Accepted items include: prescription pills, over-the-counter medication; pet medications and vitamins. These items will not be accepted: needles, syringes, lancets, thermometers, aerosol cans, IV bags, hydrogen peroxide, bloody or infectious waste, empty containers, personal products such as non-medicated shampoo, etc. The Crawford County Sheriff’s is also taking part in the nationwide program. A drop off site will be open from 10 a.m. to 2 p.m. at the sheriff’s office, 3613 Stetzer Road. Staff will be on hand to help out if necessary. Here’s what you CAN bring: Prescription pills of any kind; Over-the-counter medications; Medication samples; Pet medications; Vitamins. Here’s what you CANNOT bring: Needles, syringes, lancets; Thermometers, Aerosol cans; IV bags, Hydrogen peroxide; Bloody or infectious waste; Empty containers; Personal products (non-medicated shampoo, etc.) .